Aaron had flag football right after work on Tuesday. The kids and I attempted to go watch, but I wasn’t well prepared and didn’t know exactly where he was playing, so that didn’t work out. Chloe was disappointed, but handled it well. As we were driving home, she asked if Daddy would be home when we got home. I let her know that he was still at football, which prompted the all important question – “Did he take the iPad to work with him today?” (The kids rarely get to use the iPad, but one parent being gone slightly ups their chances of use, so she was hoping it was home.) When she found out he had it, she asked if she could use it when he got home. I told her no. Then she informed me that she’d ask him if she could use it when I left later that night to get a haircut. Such a schemer! This conversation followed between her and Devon. Tuesday night was a good reminder of why I try to be consistent with my kiddos and try not to give in when they whine. Over time, there’s a chance it’ll work and we’ll get the results we hope for – respectful, happy kids. The last few weekends have been crazy busy for our kiddos with birthday parties, movies in the theater, trips to the fire house and more. 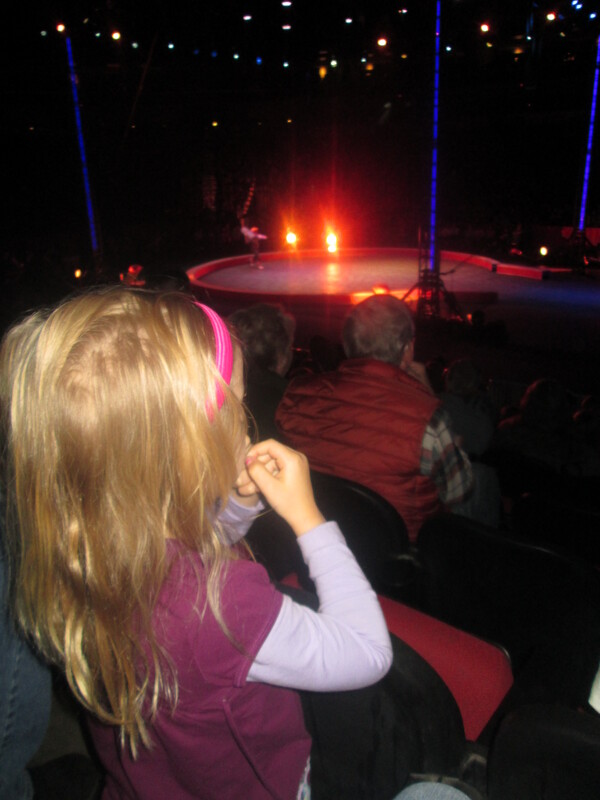 No exception this weekend – today was a trip to the circus! We didn’t tell the kids ahead of time that we were going to the circus. When we got to the parking lot, C saw the Barnum & Bailey trailer with pictures of elephants and guessed where we were headed. That resulted in C and I skipping through the parking lot, with D and the dad pretending like they didn’t know us 🙂 Bonus: Later in the show, we saw an elephant skipping. Yup, pretty cool! Adults and kiddos alike had a ton of fun tonight and created fabulous memories! Pre-show clown meet and greet! Chloe got to try out the tightrope. Chloe also preferred the floor – it was far too exciting to sit down!